On June 13-14, 2017, at the Mariysky spiritual center of Zarvanytsia, under the lead of the Father and Head of the UGCC His Beatitude Sviatoslav took place the Seventy Sixth Session of the Synod of Bishops of Kyiv Galician Supreme Archbishopric of the UGCC. Below we publish the resolutions of this session of the Synod. 1. For enlivening praying life in the Kyiv Galician Supreme Archbishopric of the UGCC and for the realization of the Strategy of development of the UGCC for the period till 2020 "Vibrant parish – place to meet the living Christ:"
А. To recommend the eparchial bishops watch over the nurturing of personal and common prayer in the seminaries and Institutions of constant formation of clergy and monastics. B. To ask the Fathers Superiors to establish at the monasteries and Houses of Orders and Congregations "schools of prayer," where monks and nuns would share with the faithful their praying experience. C. To encourage eparchial priests to organize in their parishes systematic weekly prayer meetings with the faithful, where they could learn how to pray together, to receive necessary knowledge about prayer and share personal praying experience. 2. To adopt in the second reading with recommended amendments and proposals the Pastoral Adviser "Calling on the laity for the participation in the social-political life of the country" and send it for the third reading. 3. To take into consideration the didactic materials for the courses of constant formation of priests devoted to the Holy Sacrament of Penance and recommend using them for priests in their pastoral service. 4. To adopt in the first reading the Pastoral Guidelines for Jordan visits. 5. 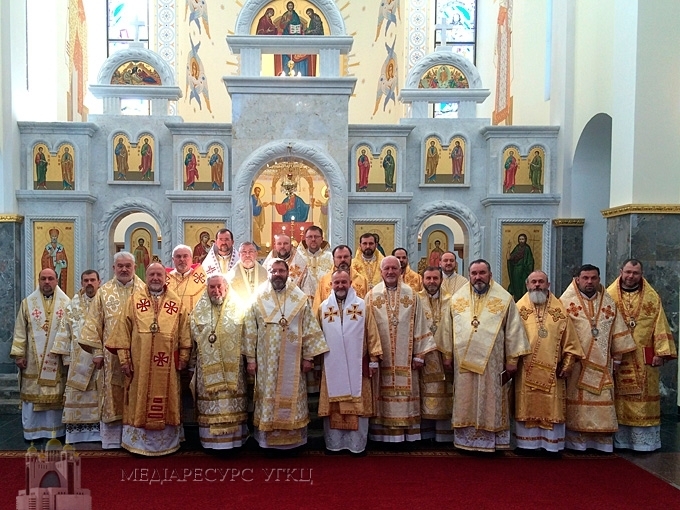 To take into consideration the report of the Commission of the UGCC "Justice and Peace." 6. In view of the celebrations of the 100-th jubilee of revelations of Our Lady in Fatima (Portugal) by the Catholic Church, to encourage eparchial priests every 13th day of month from July to October 2017 AD to hold prayers for peace in Ukraine and the world and for the development of evangelization. 7. To hold the Seventy Seventh Session of of the Synod of Bishops of Kyiv Galician Supreme Archbishopric of the UGCC in December 2017 AD. These resolutions come into effect on June 29, 2017 AD.